What started out as a delicious team meal at Sweet Mandarin back in January developed into the delivery of a brand new website for the Northern-Quarter based Chinese restaurant. Discover the brand new website here. With a wealth of impressive achievements under their belt from winning Gordon Ramsay’s F Word to cooking for the Chinese President and the British Prime Minister, creative agency Monitor were delighted to be working with the much-loved Sweet Mandarin. 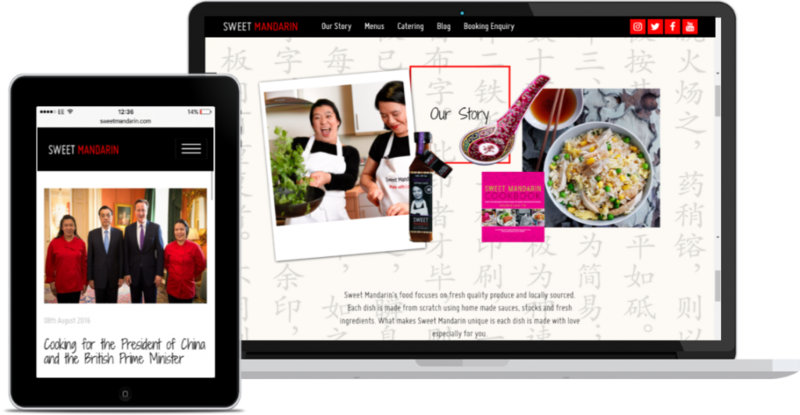 The new website needed to be user-friendly and easy to navigate whilst not compromising the personality and heritage of Sweet Mandarin. With an increase of customers accessing websites on-the-go, it was fundamental that the website worked across all devices. o An intuitive booking form helps users to quickly book a table whilst on-the-go. o The addition of an embedded Instagram feed allows users to see the exciting things Sweet Mandarin have been up to, as well as the delicious food that’s on offer. o Easy, direct access to all restaurant menus. o Clear, bright imagery provides a taste of what customers can expect. o Sticky navigation bar allowing easy navigation throughout the website. The new website will provide a solid foundation for owners Lisa and Helen Tse MBE and their ever-growing empire. To view more of our website projects click here or to discuss how to grow your online presence, get in touch with team Monitor.